Buying a log cabin for your property is a big deal. Having an entire building constructed in your back garden certainly doesn’t come cheap! Unfortunately, the log cabin market is a bit of a minefield for customers. There are absolutely loads of options out there from a huge number of manufacturers. On the face of it, the products look quite similar and, given that poor craftsmanship can take years to show, it might look like you got a great deal when in fact your new cabin has a shorter life expectancy that the average fairground goldfish. WhatShed knows how hard it is for the layperson to find their ideal cabin. We’ve made it our mission to guide the public with simple, no nonsense reviews based on real-site visits. 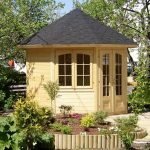 The one you’re reading is for The Carnivora 44mm log cabin by TigerSheds. The building features a rather unique design with absolutely loads of full-length windows. The cabin has a large vestibule area at the front and a classic apex roof. This is certainly one of TigerSheds’s most eye-grabbing offerings. Unfortunately, we haven’t actually seen The Carnivera up close and personal. When we visited the company’s showroom in Leeds, the 44mm cabins on display were The Rho, The Procas, and The Shere. Although these three cabins look different to the Carnivera, they all share identical materials and building methods. Anyway, first impressions covered, let’s take a look around this visually distinct cabin. Unique style. Some customers will surely fall in love instantly with The Carnivera. Company owns its own sawmill. Company sales module doesn’t include all available options. No treatment included in price. Would lose a lot of headroom in making it regulatorily-compliant. Being possibly the most uniquely shaped cabin in the 44mm range, The Carnivera by TigerSheds is only available in one listed size. This is 14’ by 14’. However, since it operates its own mill in Yorkshire, the firm will offer to customise any of its 44mm cabins for a price. This is one of the many perks of TigerSheds having the facilities to cut wood to order. Arguably both a good and bad feature, depending on your perspective, The Carnivera stands at 2932mm. This loftiness makes it one of the tallest cabins offered by TigerSheds. Whilst many customers will be wowed by the impressive structure and its vast headroom/storage space, unfortunately, the height does mean that it will fall foul of certain planning regulations. Some local authorities state that all garden buildings positioned within 2m of a house must be under 2.5m, which, of course, The Carnivera is not. As part of the service, TigerSheds does offer to reduce the height of any of its cabins. However, one issue with taking the company up on this for The Carnivera is that it might compromise the comfort of the finished building. At almost 3m at its highest point, the walls would need to be reduced by at least 432mm for it to be considered regulatorily-compliant. Dropping the walls by this much might make the space inside feel too claustrophobic for some. 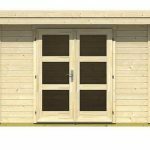 However, all TigerSheds’s 44mm cabins feature the same robust construction methods and are finished to an equally high standard. Customers not wanting to compromise on space but are concerned about planning regulations are recommended to explore some of the firm’s pent-roofed cabins, such as The Rho. The basic construction materials of the 44mm cabins are all the same. Each is built using logs sourced from slow-growing European redwoods. It’s common to see inferior materials, such as Baltic white wood, used by some manufacturers to cut costs. Although it might make for a cheaper cabin for the customer (and a greater profit margin for the company), the resulting cabin will be much more prone to warping and splitting down the line. Again, we should draw attention to TigerSheds’s Yorkshire-based mill here. Being cut to order, logs used for The Carnivera are much less likely to have warped or become damp at the side of a dock or in a warehouse somewhere, waiting to be bought. Not all manufacturers can cut wood to order and this is surely one of the things that distinguishes TigerSheds from many of its peers. As with the entire 44mm range, The Carnivera is supplied untreated and must be coated with a spirit-based product within 14 days of construction for it to withstand the elements for years to come. TigerSheds carries two different product lines to treat its cabins with. The first is the company’s own product – TigerCare – which is available in Red Cedar, Mahogany, Dark Oak, and Clear. The second is provided by Cuprinol. 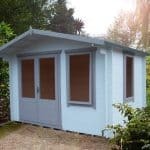 The colours stocked by TigerSheds from the respected manufacturer are Seagrass, Pale Jasmine, Forget-me-not, Summer Damson, Olde English Oak, and Black Ash. One thing that did annoy us a little was the fact that TigerSheds charges for this necessary addition to their cabins. Given that each unit costs thousands of pounds, we found it a little bit stingy of the company to not throw in a 20 quid bottle of treatment! 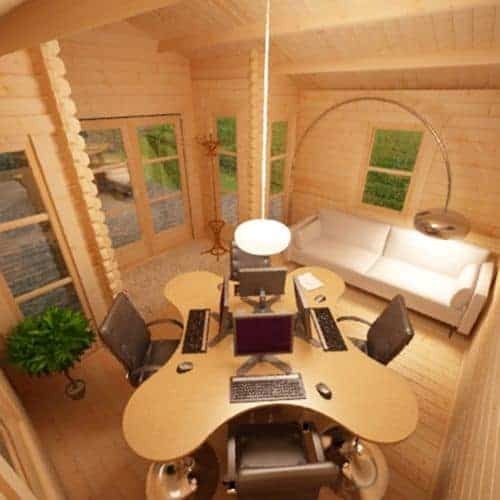 One of the most important aspects to consider when choosing a new log cabin is surely the construction methods used for the walls. We’ve already established that TigerSheds uses great materials but does the quality of its assembly matchup? The Carnivera uses 44mm, four-way chamfered logs throughout. You can see from the joins at the corners of each wall that these really are going to stand the test of time. The sheer size of the timbers inspired a lot of confidence from us in the longevity and security of the building. These logs are connected using a double tongue and groove system. This is over and above what is strictly necessary but certainly results in a far sturdier cabin overall. 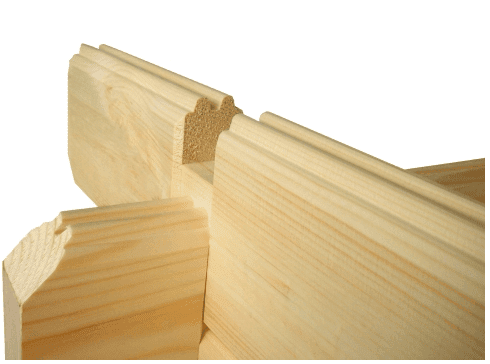 Some manufacturers cut corners here by offering just single tongue and groove or even a square cut notch joint. This can mean that their prices are lower upfront, but the quality of the finished structure simply can’t compare. In terms of the walls’ appearance, the chamfering gives a real look of quality. We also found that the European redwood used provides a much smoother finish with fewer knots as standard than seen on cabins using Baltic white. Matching the walls in terms of construction quality is the roof of The Carnivera. Keeping the rain out is a canopy of 19mm roof boards also joined using tongue and groove. We were pleased to report that TigerSheds stuck with this slightly more costly but ultimately superior building method for its roof. Some manufacturers have used cheaper shiplap or similar techniques and their products simply can’t compete in terms of weather-resistance. Supporting this high-quality roof is a framework of 44x120mm purlins. These are completely rebated and provide a wonderful gapless finish to the roof. Other manufacturers may opt for less substantial purlins but again, this only saves money in the short-term. Such cost-cutting measures are not synonymous with quality products! Topping the roof on the entry-level edition of The Carnivera is heavy-duty green mineral felt. This provides excellent resistance to the elements and we were impressed that such a high-quality covering has been used as a standard feature. We have seen competitors omit to include such a robust covering with their cabins for the listed price. To be honest, we’ve even seen them include none whatsoever! Although more than adequate in terms of protection from the elements, the mineral felt can be upgraded to shingles on The Carnivera for a price. These come in a range of colours – green, black, brown, and red – and have an exceptionally high bitumen rating. They’re equivalent to those used on houses. Black guttering can also be added to all the 44mm range. This comes predrilled and ready to simply screw into place. We loved that TigerSheds has made each of its upgrades easy to install. By not requiring particularly special skills to erect, customers can often do without paying the rather expensive assembly fees. The floor of a cabin can really make or break it (literally!) One of the most common ways for a garden building to meet its demise is by it succumbing to damp underfoot and rotting from within. Just knowing that the walls and roof are completely weather-resistant is not enough to prevent this. Fortunately, we can report that the floor is one of the standout features on The Carnivera cabin. It lies atop 44x57mm tanalised (pressure treated) bearers. This treatment provides an exceptional resistance to damp. The floor itself is comprised of 19mm planed floorboards. Again, these are connected using tongue and groove for a superior fit than possible in those cabins using other construction methods. Although we were not able to see The Carnivera itself when we visited the showroom in Leeds, we did manage to see similar models from the 44mm range that use exactly the same floor construction. We were hugely impressed by the overall quality of the floors and, even when moving around cabins with a heavier-than-average-foot, we couldn’t feel it budge at all. Since TigerSheds employs a skilled team of craftspeople, it really excels when it comes to windows and doors. All are constructed by professional joiners and this is evidenced by stylish design features such as the architrave inside and out, the bespoke frames, and even how snuggly they all fit into their frames. The Carnivera features two massive double doors for easy access, and six vast windows in two different styles. With so much glazing on the building, this really is going to be one for those customers who simply must have as much natural light within their cabin as possible. The doors and windows on The Carnivera are the firm’s European style as standard. These are suitably elegant, yet despite being TigerSheds’s least flamboyant offering, still provide a lot of scope for the joiners that created them to show off their skills. Georgian – Multiple small panes. Creates a traditional, cute cottagey vibe. Full pane – A huge single pane that comes with toughened glass as standard. 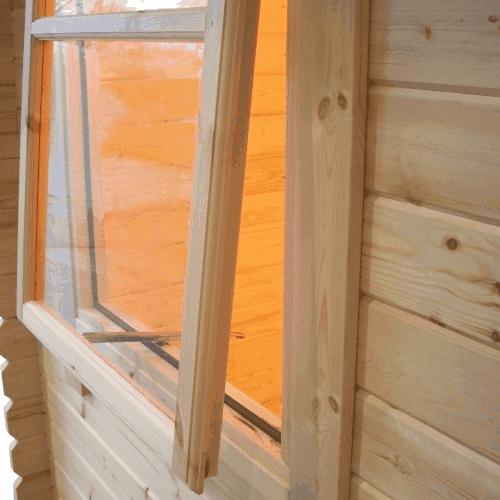 If you’re all about natural light in your cabin, this is the choice for you. PVC – Double glazed. Offers the ultimate in both security and insulation. Fully boarded – No glass. 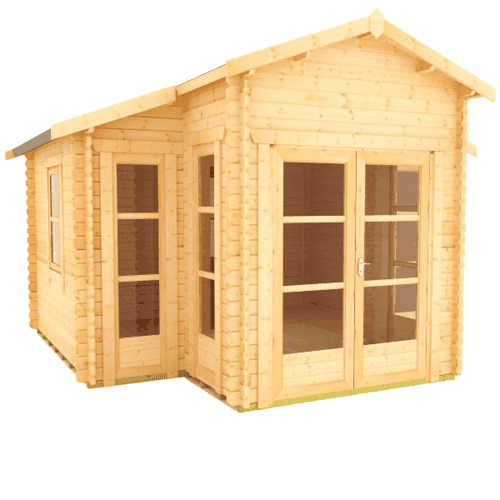 Some cabin uses demand such ruggedness and durability. The glass used on the entry-level Carnivera is an impressive 3mm. Given that some competitors have been known to use much thinner panes as standard, TigerSheds’s choice of a more durable glazing solution, without asking the customer to pay extra, is surely worthy of praise. Although its standard glazing is easily insulative enough for almost yearlong use, The Carnivera can be equipped with either toughened 4mm glass or double glazing. This latter upgrade features two sheets of the toughened glass with a 6mm airgap – providing customers with a better glazing solution than featured on many houses! All the glass offered by TigerSheds is fully draft sealed, as well as being beaded both internally and externally. The firm even rebates windows and doors into their frame giving an exceptionally snug fit. We’ve seen examples of log cabins that have had their doors hung externally and that don’t feature the same recessed hinges as The Carnivera. Such cost cutting ultimately results in a much less secure cabin since inferior windows and doors can often simply be ripped off using a crow bar. When it comes to security, TigerSheds once again goes above and beyond the call of duty. Doors are fitted with a top and bottom bolt lock. For even greater peace-of-mind, however, the company uses three-lever mortice locks as standard. Much like the ones found in houses, the inferior cylinder locks often provided for competitors’ cabins simply can’t match the quality of this robust security offering. Upgrades are available here to. A five-lever mortice lock and a range of security lights and alarm systems can be included on request. 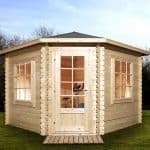 As you can see, TigerSheds gives customers loads of scope to customise their log cabins. That’s without mentioning the exterior planters, flower beds, and decking that can also be included. However, actually finding out how to include some of these features is something of a challenge since not all the optional extras are listed on the sales module. This minor quibble can, however, be rectified simply by contacting the company to discuss whatever it is you want adding to the cabin. Thanks once again to TigerSheds’s own sawmill, a range of additional customisations can also be included at the customer’s request. This can be the addition of partition walls or extra windows, and even adjustments to the placement of doors and windows. Those wanting to alter the structure itself in such a way are encouraged to contact the manufacturer to discuss just what’s possible and prices. The Carnivera includes full professional delivery within its entry-level price. The cabin arrives on the back of an 18-ton HIAB truck, which is equipped with a crane. Using heavy machinery to deliver products once again shows TigerSheds’s commitment to customer satisfaction. Competitors will often hand deliver products. This invites a far greater risk of damage being caused to components during transit. A full professional installation can also be included for The Carnivera. Many customers won’t deem this necessary thanks to how easy to build TigerSheds has made its cabins. Even non-standard features like guttering or flower beds are easy to fix to the structure. That said, some will surely appreciate the option to have TigerSheds’s professionals take care of the erection of their cabin for them. The option is rather expensive though and this is one of the few downsides to the overall service provided by TigerSheds. Throughout the construction of The Carnivera, TigerSheds’s expertise and commitment to quality is on display. As you’ve seen, we’re really impressed by just how far the company is willing to go to satisfy the customer. 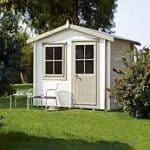 From their almost limitless customisation options to the high-quality, joiner-crafted features, almost no stone is left unturned by TigerSheds. That said, the building has a couple of downsides – not all caused by itself either. Firstly, the decision by TigerSheds not to include a treatment when the customer is spending thousands of pounds seems a bit mean. Then there’s the height of the structure. Many customers living in areas affected by the planning regulations mentioned above would find the walls in a reduced-height Carnivera much too low. Realistically, it’s probably not the cabin to be taking up TigerSheds on its offer to cut a few inches off the top to remain compliant with such regulations. These are, however, minor downsides. 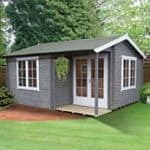 Overall, the quality of The Carnivera is top notch and if you’re in the market for an eye-catching and exceptionally built log cabin, you can do much worse than this one. This is a solid cabin for the price.